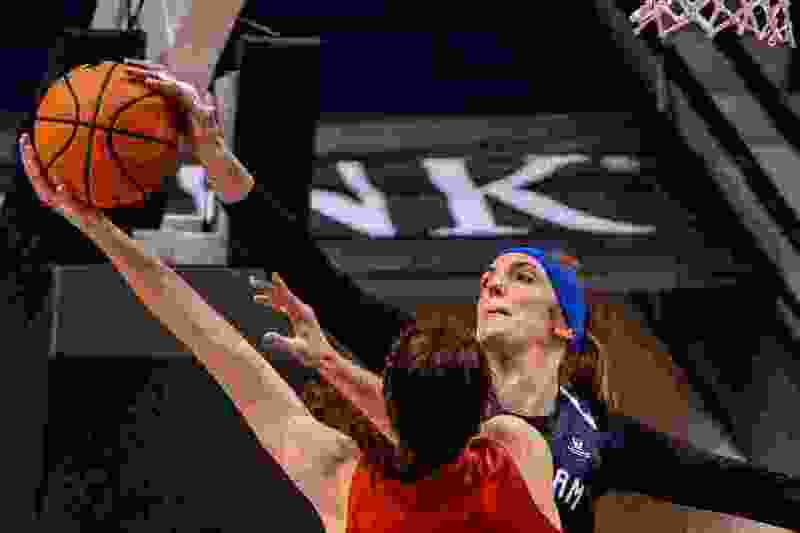 (Trent Nelson | The Salt Lake Tribune) BYU coach Jeff Judkins said the emergence of center Sara Hamson, shown here blocking a shot by Utah's Megan Huff, is one of the reasons the Cougars are on the NCAA Tournament bubble heading into the WCC Tournament this week. Provo • A month ago, the BYU women’s basketball team’s hopes for an at-large bid to the NCAA Tournament appeared dead. The Cougars fell 78-75 to Saint Mary’s in a Thursday matinee in front of 3,500 elementary school students on Feb. 7, their third-straight defeat. The devastating home loss dropped their overall record to 17-6 and came 10 days after they had cracked the Associated Press Top 25 ranking for the first time since 2012. “We were really demoralized,” said sophomore guard Paisley Johnson. But the Cougars haven’t lost since, reeling off six impressive wins, including a 66-64 upset of No. 13 Gonzaga in Spokane to sweep the season series with the Zags for the first time. And now they are back on the NCAA bubble, maybe even inside it, heading into the West Coast Conference Tournament at Orleans Arena in Las Vegas. The Cougars (15-3, 23-6) earned the No. 2 seed and won’t play until the semifinals on Monday under the new format instituted last spring. That will come nine days after BYU last played, but coach Jeff Judkins is grateful for the rest. The hard part this week, Judkins said, is not knowing who they will play. It will likely be No. 3 seed Pepperdine, which will play either Santa Clara, San Diego or Pacific on Saturday afternoon in a quarterfinal game. The tournament champion gets an automatic berth to the Big Dance, so that’s obviously BYU’s goal. But what if the Cougars fall short? Are they still in? The top-seeded Zags (16-2, 27-3) have won the last two WCC tournaments, will be backed by a heavily pro-GU crowd, and are a lock for the NCAA Tournament. Gonzaga’s goal is to get a four seed or better so it can host first- and second-round games in Spokane. ESPN’s latest Bracketology projections have BYU as a No. 9 seed playing No. 8 Michigan in Louisville. Gonzaga is a No. 5 seed in Charlie Creme’s weekly predictions. The last four in are 10 or 11 seeds: Indiana, TCU, Tennessee and Buffalo. BYU’s RPI is 33; The Cougars beat fellow bubble-sitter TCU 61-58 in San Diego on Nov. 23, their biggest win outside the Gonzaga victories. However, Collegesportsmadness.com did not have BYU in the tournament in its March 4 projections. BYU is among the first eight out. The Cougars last made it to the NCAA tournament in 2015-16 as an at-large entrant after losing 70-68 to San Francisco in the WCC tournament final. Seventh-seeded BYU fell 78-69 to No. 10 seed Missouri in Austin, Texas.